A good defense can make a huge difference for your fantasy team but these days defenses can go from being terrible one year to great the next (and vice versa) in the blink of an eye. Two years ago the Chiefs defense was terrible – a team you hoped all your offensive starters were matched up against. Last year they finished the year as the top overall D/ST in most formats. Fantasy defenses aren’t quite as unreliable as kickers, but they aren’t too far off either, so as good as Seattle has been the past few years don’t be the guy (or girl) who drafts them in round five unless you want to be looking up at the rest of the league in December. You don’t have to wait until the last round to draft one like kickers, but I definitely wouldn’t be drafting one until every good running back and receiver is off the board. Don’t worry, there will be plenty of good defenses left and even more that show up on the waiver wire, so be aggressive and you’ll find a good one. If you missed any of our other rankings you can find a full list of 2014 Fantasy Rankings here, or in the blue bar above. Please leave your comments below on this or any of our posts… we love getting feedback from our readers! Who Are The Top Defenses In Fantasy Football? 1. Seattle Seahawks – The league’s most dominant defense in each of the last two seasons and there is no reason to think they can’t repeat. 2. Carolina Panthers – Quietly led NFL in sacks, finished 2nd fewest in yards allowed and had 30 takeaways in 2013. Dominant front seven returns for 2014 and they could get better. 3. Cincinnati Bengals – Quality players at nearly every defensive position, but need a healthy Geno Atkins to make it all work. Loss of DC Mike Zimmer hurts but they should overcome. 4. St. Louis Rams – Quinn, Long and now Aaron Donald could be an extremely dominant defensive line, but secondary is suspect. 5. Kansas City Chiefs – Had an easy schedule in 2013, but they are loaded with elite or near-elite player at almost every position. Tougher 2014 schedule won’t help but follow the talent. 6. San Francisco 49ers – Still a solid defense but the NaVorro Bowman injury really knocks them down a tier but the silver lining is it makes Patrick Willis an IDP stud again. 7. Denver Broncos – The additions of DeMarcus Ware and Aqib Talib shores up some of last year’s weaknesses but they’re both aging and need to stay on the field for it to work. 9. 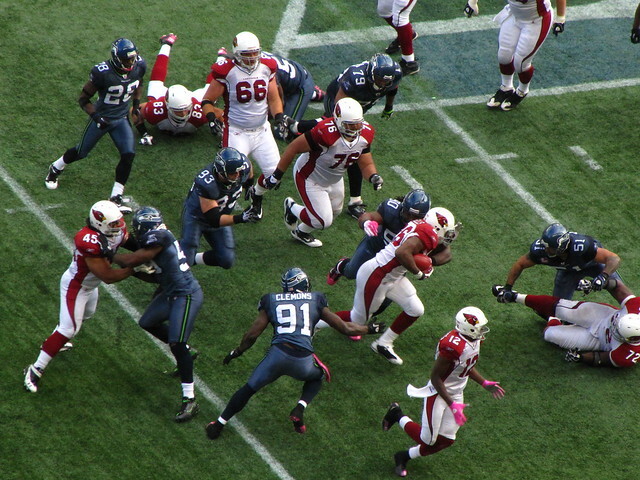 Arizona Cardinals – Best in NFL vs the rush in 2013. Solid starters across the board but suspension of Daryl Washington will likely prevent them from reaching the next level. 10. New England Patriots – Addition of Darrelle Revis is nice but they lost Talib to the Broncos. They badly need Vince Wilfork to stay healthy or they’ll be very susceptible to the rush. Playing in below average AFC East is a nice perk. 11. Cleveland Browns – Under rated defense in 2013, added Karlos Dansby in the off-season. Needs to cut down on passing touchdowns allowed to take next step in fantasy. 12. New York Jets – One of the league’s best 3-4 defensive lines, but linebacking corps is very suspect. Rookie Calvin Prior is a nice addition to secondary. 13. Chicago Bears – League’s worst rush defense (by a lot) in 2013, but addition of Jarred Allen and return of Lance Briggs should help. Interior defense still a question. 14. Baltimore Ravens – Talented defense but usually over-drafted by fantasy owners due to memories of dominating in the Ray Lewis peak years. Rookie LB CJ Mosley is a nice addition. 15. New Orleans Saints – A surprise 4th in yards allowed but also bottom 5 in takeaways in 2013. Impressive defensive line plus additions of Jarius Byrd and Champ Bailey should help generate a few more turnovers. They’re a defense to watch. 16. Pittsburgh Steelers – Getting older quickly, but still solid defense all around. They’re always near the best in yards allowed but 5th fewest takeaways in NFL in 2013 hurt their fantasy numbers. 17. Detroit Lions – Defensive line is dominating but corners are very suspect. Rookie Kyle Van Noy upgrades linebacking corps nicely if he starts. I like their upside but not ready to draft them as my starting D.
18. New York Giants – Dramatically upgraded secondary but now defensive line is suspect. Big Blue needs JPP and Beason to stay healthy or they could be in a lot of trouble. 19. Miami Dolphins – Defensive line has a lot of promise but the rest of the defense is pretty average. For now they’re a matchup defense vs weak AFC East opponents. 20. Buffalo Bills – I was ready to declare them my sleeper defense of the year until Kiko Alonso tore his ACL (out for the season). Without him they’re solid, but not spectacular and probably just a bye week replacement. 21. Tampa Bay Buccaneers – Gerald McCoy and Lavonte David are outstanding but the rest of the defense is just average. Lovie’s Tampa 2 defense should improve defense as a whole but by how much? 22. Philadelphia Eagles – A lot of young talent on this defense, and another year in the 3-4 will do them a lot of good. Keep an eye on them in 2014, they could surprise. 23. Green Bay Packers – Bottom third in rush yards, pass yards and take aways in 2013. The Pack added Peppers in the off-season and will gets Clay Matthews back healthy, but I don’t see a lot of upside and the NFC North is loaded with dynamic offenses. 24. Oakland Raiders – Additions of Justin Tuck, Lamarr Woodley and Antonio Smith a veteran presence team lacked for years. Khalil Mack has a lot of upside. Raiders could surprise in 2014. 25. Tennessee Titans – Without a real standout at any position on defense I don’t see how they’re going to be more than a league average fantasy defense. 26. Indianapolis Colts – On an otherwise mediocre defense, Robert Mathis suspension (out 4 games for drug violation) is a killer. 27. San Diego Chargers – Outside of Eric Weddle I don’t see any real playmakers anywhere on this defense. Consider them nothing more than a matchup play when they face Oakland. 28. Jacksonville Jaguars – Defense doesn’t excel in any one area, but I like the addition of Chris Clemons and I believe in Gus Bradley’s scheme. They’re probably still a few years away from fantasy relevance though. 29. Minnesota Vikings – Mike Zimmer is a great defensive mind but he just doesn’t have the horses. Losing Jared Allen only makes things worse. 30. Washington Redskins – Front seven isn’t bad, but the back half of the defense is just brutal. They could be a matchup gold mine for passing offenses. 31. Dallas Cowboys – On a defense that was bad already, Sean Lee’s injury is a killer. Get ready for some Texas sized shootouts! 32. Atlanta Falcons – Like Dallas, lost best LB Sean Weatherspoon and defense was average anyway. Could be a long season in Hotlanta.